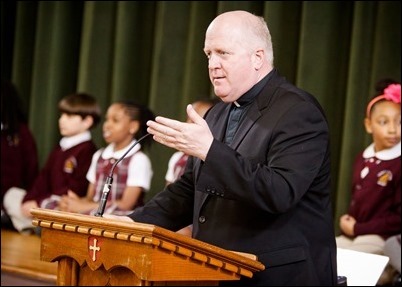 I want to begin this week saying how grieved we are by the terrible attack that took place this week in Manchester, England. 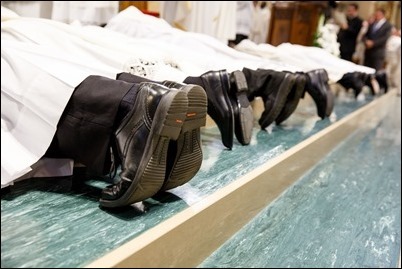 While all such acts are terrible, this one seems particularly distressing because of the number of children and young people who lost their lives or were horribly injured. 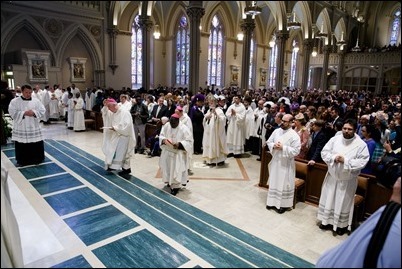 We continue to pray for the victims and that the scourge of terrorism in our world will be overcome. 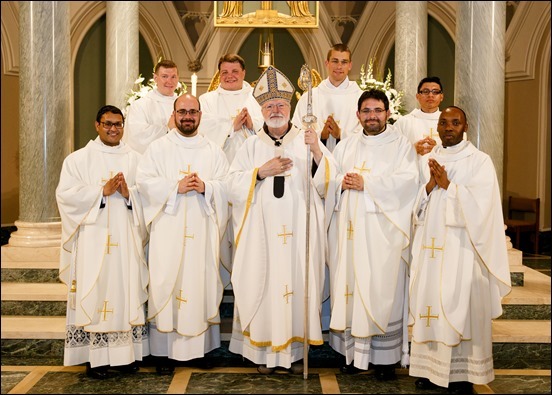 Last Saturday, I had the joy of ordaining eight men as new priests for Boston at Immaculate Conception Church in Lowell: Fathers Jason Giombetti, Pablo Gomis, Kevin Leaver, Godfrey Musabe, Wellington Oliveira, Americo Santos, William Sexton and Michael Zimmerman. 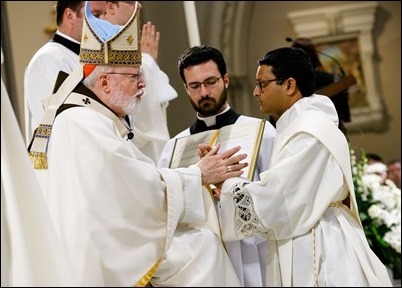 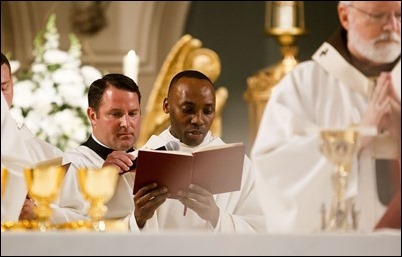 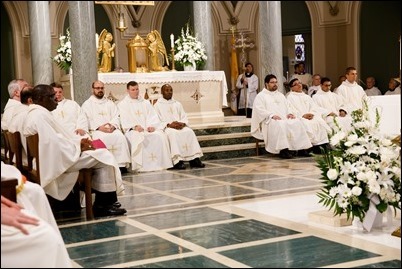 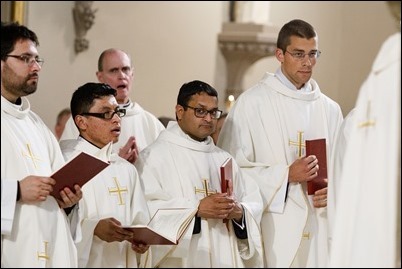 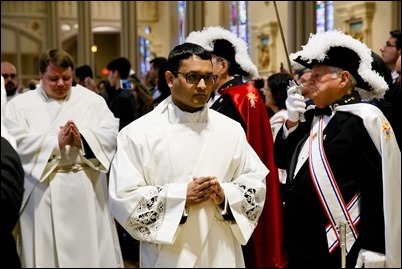 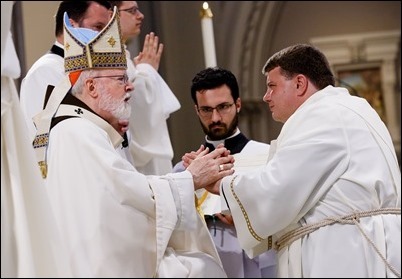 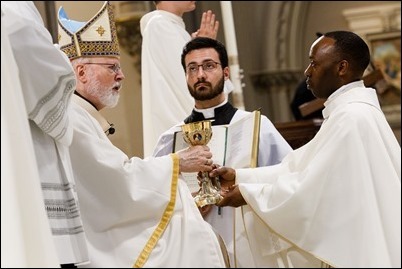 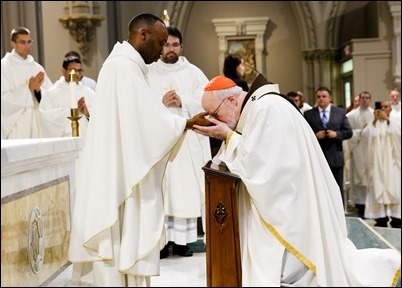 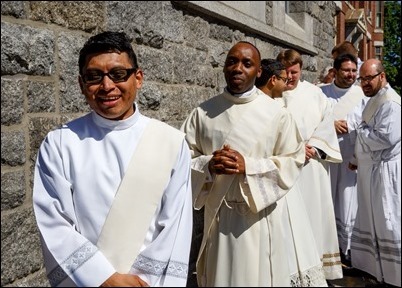 Among the ordination class were two Spanish-speaking priests, a Brazilian priest, and the first Ugandan priest ordained for the Archdiocese of Boston, Father Musabe. 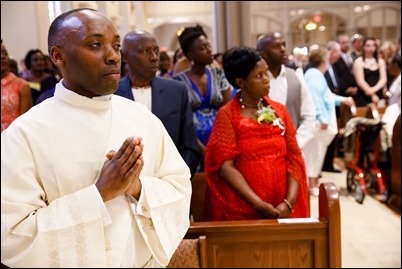 Many members of the Ugandan Catholic Community at St. Mary’s Parish in Waltham were with us for the ordination, as well as Ugandan Bishop Paul Ssemogerere of the Diocese of Kasana Luweero. 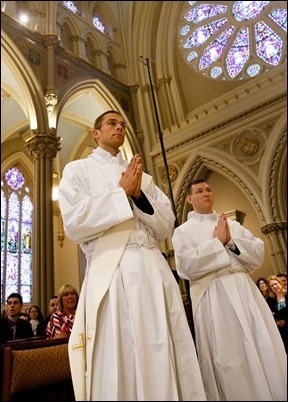 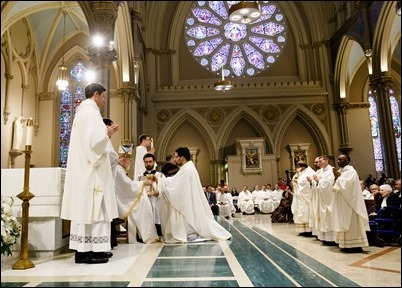 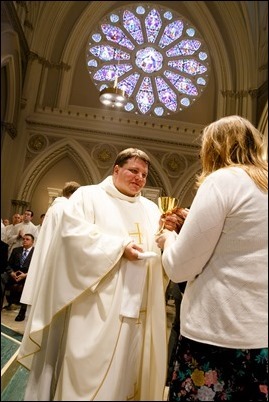 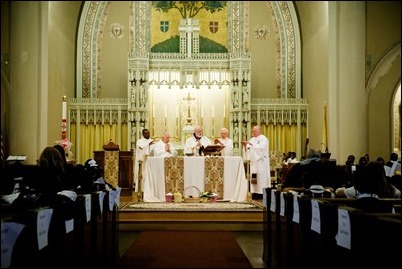 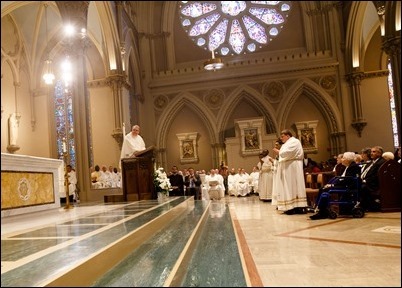 The ordination was held in Lowell because of planned renovations in the Cathedral. 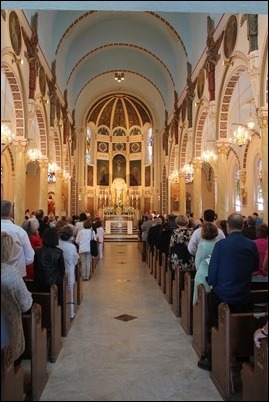 Immaculate Conception Church was recently renovated due to the efforts of the pastor, Father Nick Sannella, and we were anxious to showcase this beautiful church. 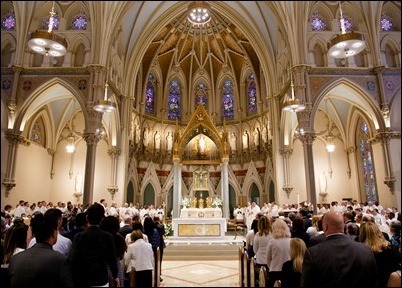 The upper church had been closed for quite some time and was really in dreadful shape, but thanks to Father Sannella, the church was truly salvaged and returned to its original extraordinary beauty. 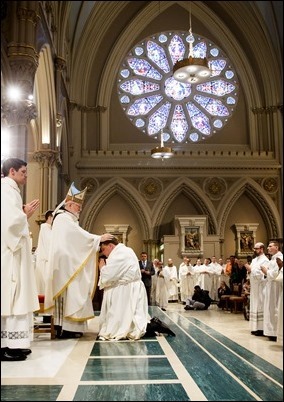 We know the people of Lowell are very proud of the church, so we were happy to have the ordinations there. 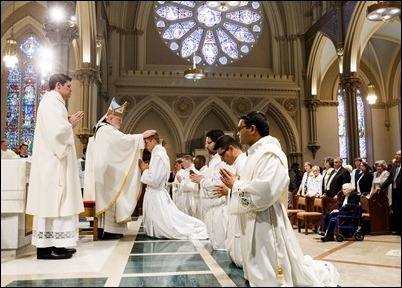 We were delighted to be joined for such a large crowd of people for the ordination. 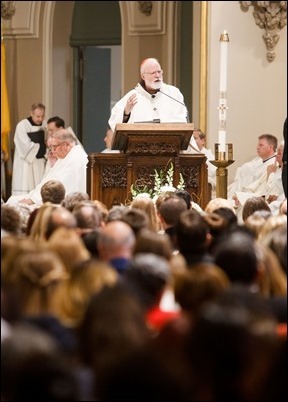 As large a church as it is, there was still standing room only. 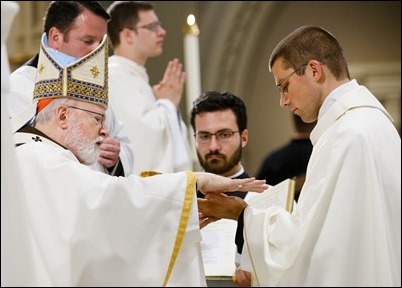 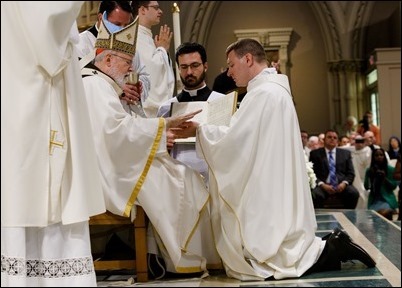 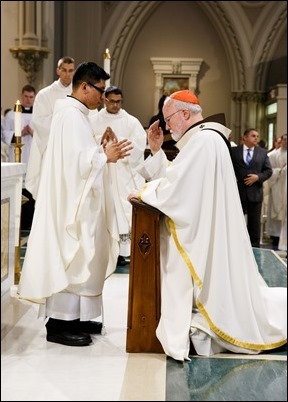 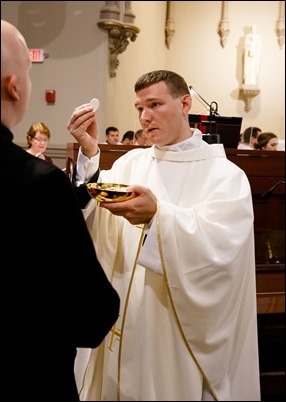 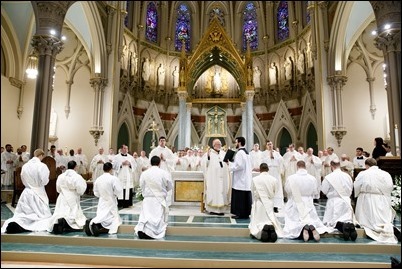 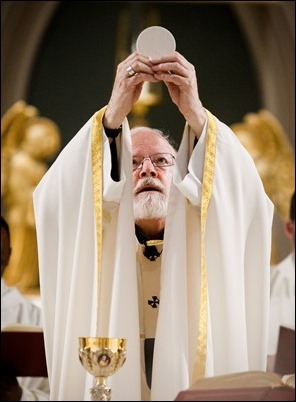 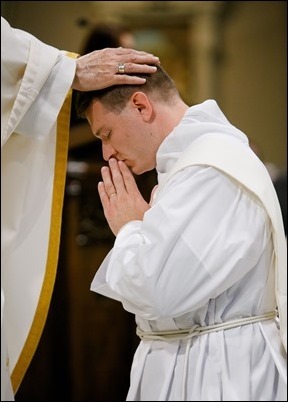 This is just another sign that the ordination of new priests is such a continual source of hope for the Catholic community. 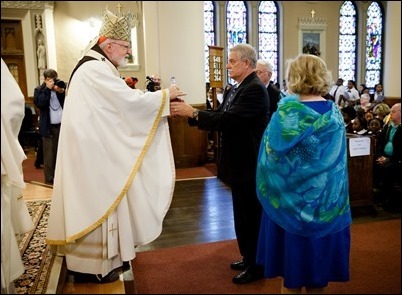 I left directly from the ordination to celebrate the wedding Mass of Tom and Nancy Heyne. 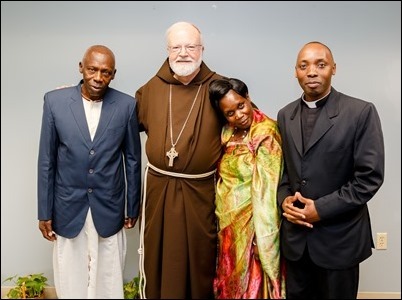 Tom and Nancy are physicians who are preparing to become medical missionaries. 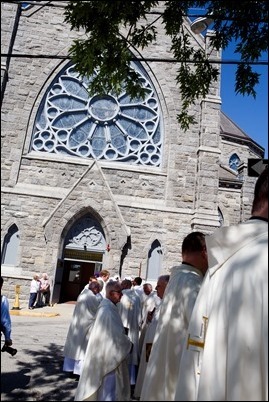 They had a beautiful nuptial Mass at St. Paul’s in Cambridge. 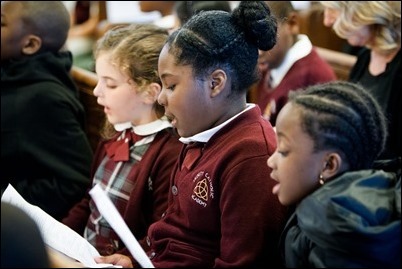 St. Paul’s is, of course, the home to the Choir School, so the music was just stunning. 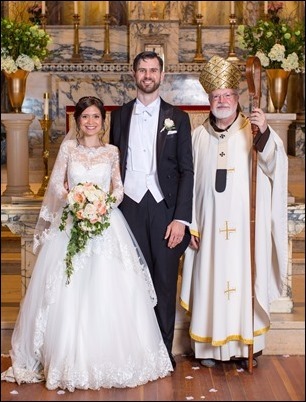 I was honored to be asked to officiate at their wedding and it was a joy to be able to celebrate an ordination to the priesthood and a wedding — two sacraments of Christian vocation — on the same day. 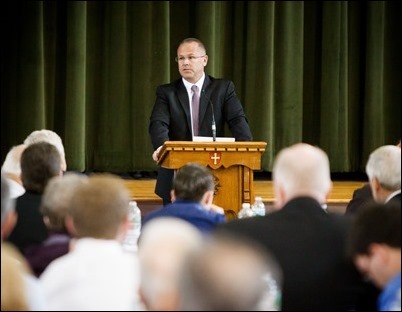 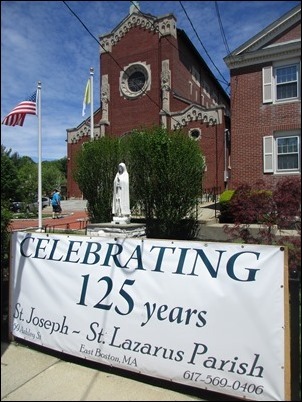 Sunday, I went to St. Joseph-St. Lazarus Parish in East Boston to celebrate a Mass to mark their 125th anniversary. 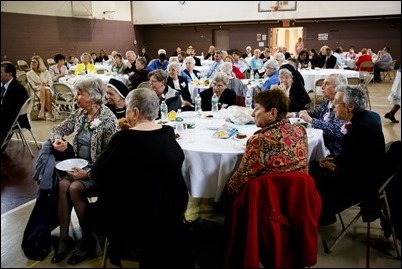 The parish was originally very much comprised of Italian immigrants, but today there is a very large Hispanic and Brazilian community in the parish. 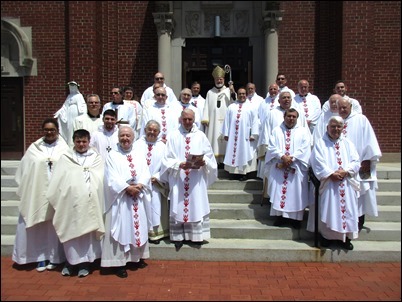 For a number of years, the parish has been staffed by the Don Orione Fathers, and we were pleased to be joined by the General Superior of the Don Orione Fathers, Father Oreste Ferrari; their Secretary General, Father Janus Sowizdrzal; the pastor of St. Joseph-St. Lazarus, Father Mirek Kowalczyk, as well as a number of other priests. 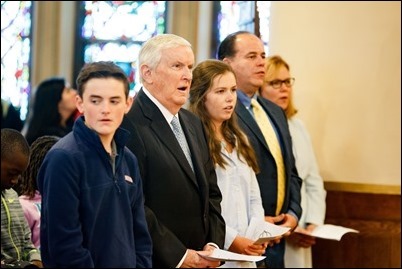 We also were pleased to be joined by Mr. and Mrs. Joseph Ruggiero, who have given significant time and effort in support of the parish and East Boston Central Catholic School. 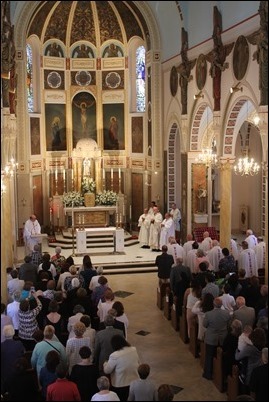 It was a beautiful Mass and was followed by a reception in the parish hall. 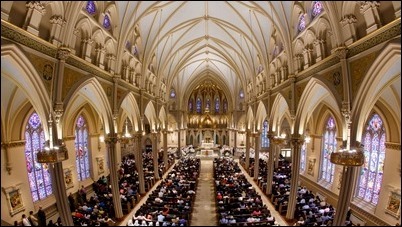 Unfortunately, I was unable to stay because I was scheduled to celebrate a baptism and confirmation at the Cathedral that afternoon. 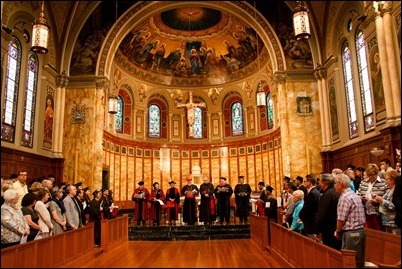 Monday morning, I went to Boston College for their annual commencement ceremony. 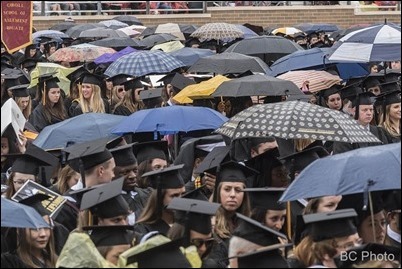 It was a beautiful graduation despite the rain. 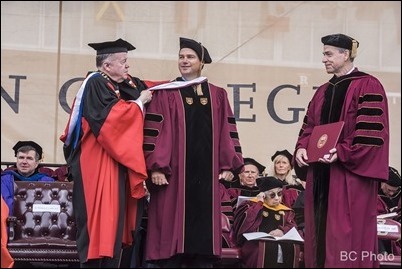 Among the honorary degree recipients this year was actor Chris O’Donnell, who attended Boston College, as well as Amy Guen, a member of the Chinese Catholic Community at St. James Parish who graduated from B.C. 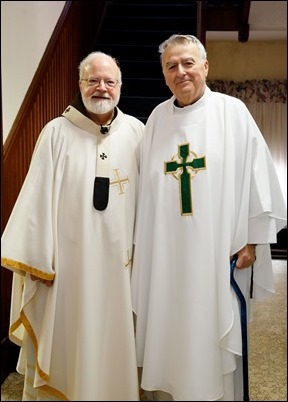 more than 60 years ago. 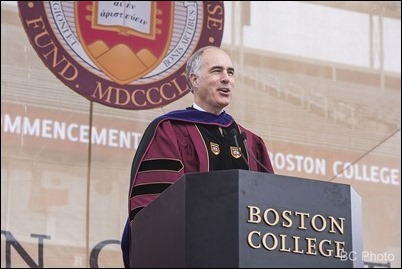 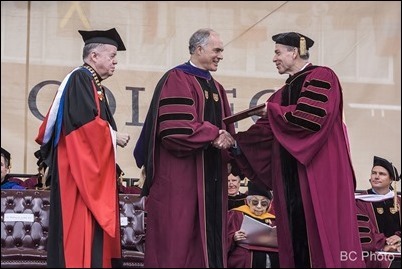 Sen. Bob Casey also received an honorary degree and was this year’s commitment speaker. 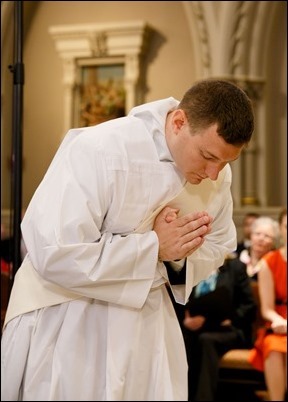 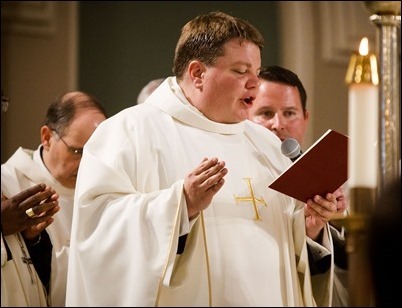 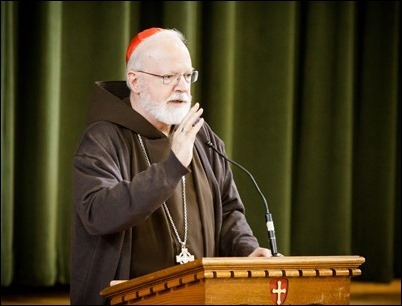 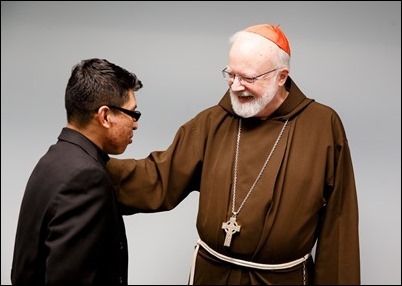 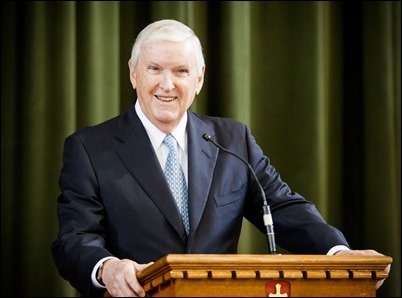 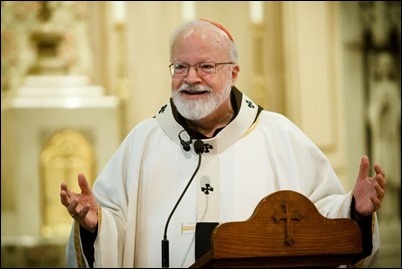 He is a graduate of Boston College and had served as a Jesuit volunteer. 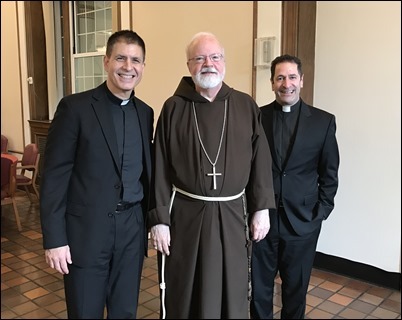 Father Wayne Belschner also received his doctorate and represented his class in receiving his hood and diploma from Father Leahy and Tom Fish. 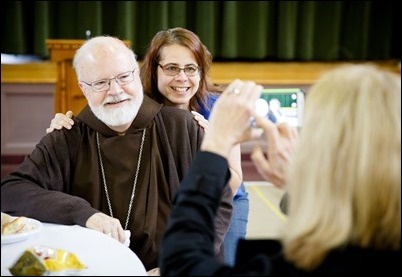 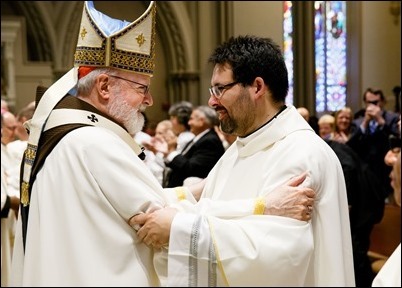 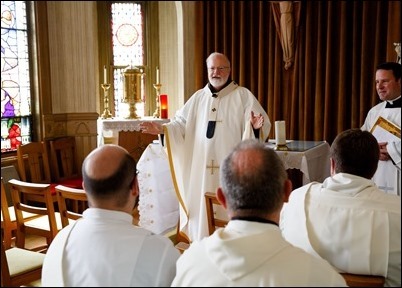 Following the graduation, I joined the Provincials of the Jesuit Conference of Canada and the United States who were holding their annual meeting this year at the Campion Center in Weston. 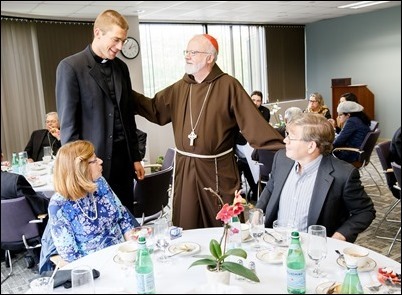 I joined them for lunch and a time of dialogue on such issues as the state of the Church and Catholic education. 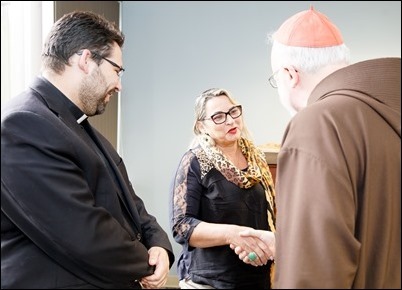 It was a very interesting discussion. 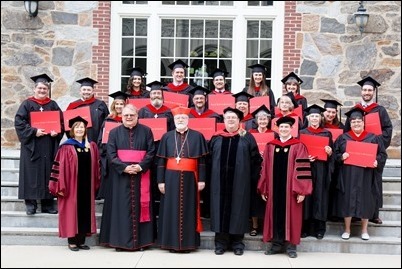 Then, in the afternoon, I went to St. John’s Seminary for the commencement of our own Theological Institute for the New Evangelization, where 17 graduates received their diplomas. 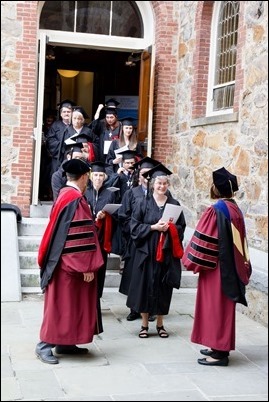 Eric Landers, who works with us at the Pastoral Center, offered remarks on behalf of the graduating class and Dr. Christa Klein delivered the commencement address. 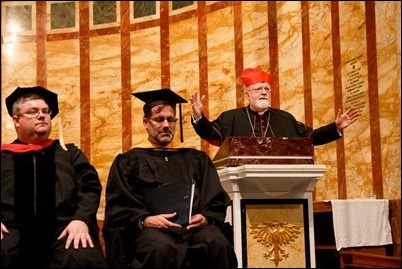 It’s always a joy to attend this commencement every year. 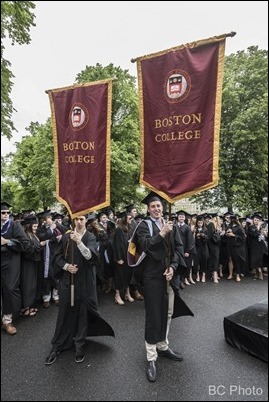 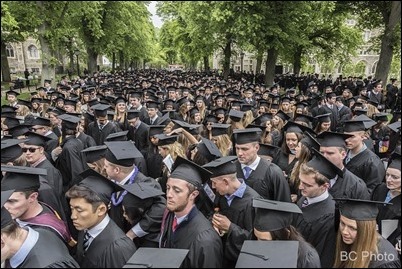 As I mentioned in my remarks to the graduates, in Boston we have 65 colleges and universities. 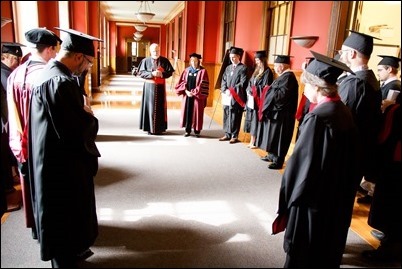 So, it is a place where academic formation is highly valued, yet, at the same time, there is a great deal of religious illiteracy. 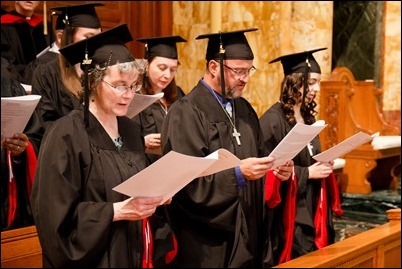 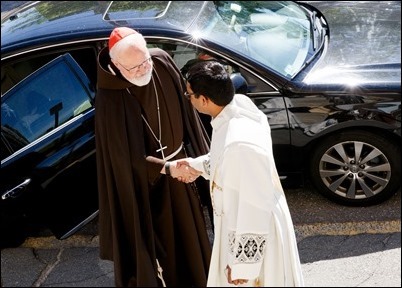 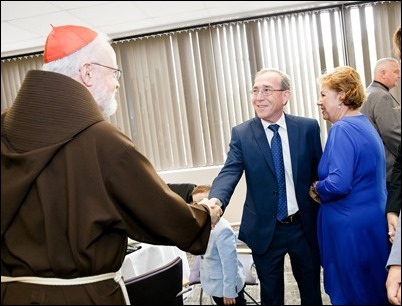 One of the great responses of the Church to this situation is the Theological Institute, which gives people the opportunity for deeper faith formation. 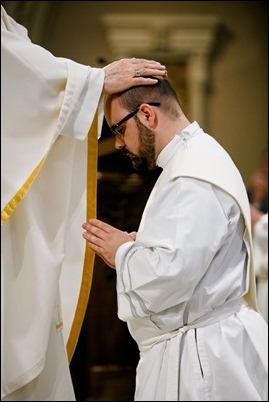 One of the characteristics of the program is that it goes beyond just intellectual formation, but provides spiritual and pastoral formation, as well, to prepare our people to be more effective lay ministers in the Church. 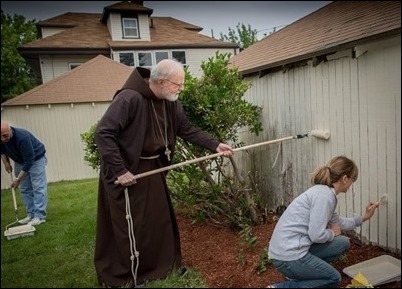 Wednesday I paid a visit to our volunteers from the Pastoral Center who were taking part in our annual Parish Service Week, a time when workers from our Central Ministries take time out to travel to a local parish to give it a “spring facelift”, as it were, with such things as cleaning, painting and landscaping. 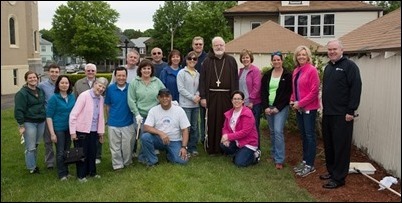 While I was at St. Brendan’s I also took the occasion to visit the Irish Pastoral Center. 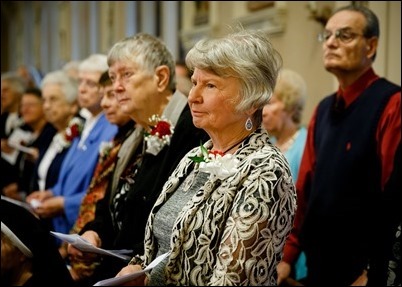 When I dropped in, they were enjoying their tea and soda bread! 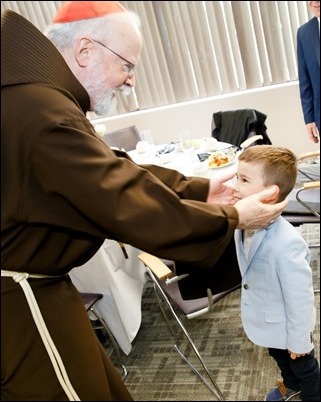 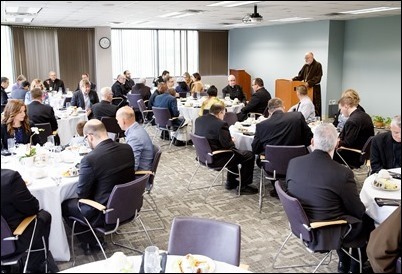 Also that day, we held our annual luncheon for the newly ordained priests and their families at the Pastoral Center. 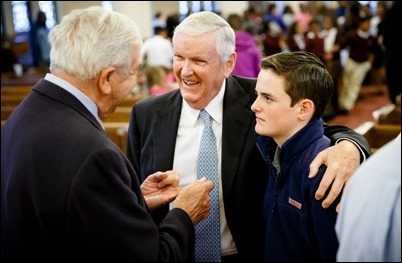 This is a lovely custom we have here in Boston, bringing the families together during the week following the ordination and first Masses to have an opportunity to spend some time together. 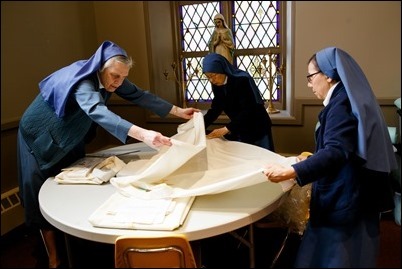 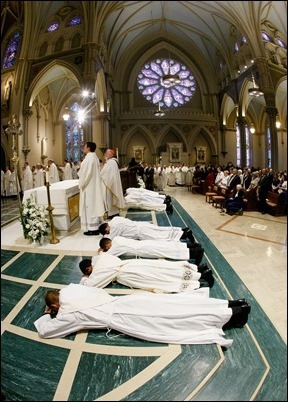 The time around the ordination is just so hectic that it is impossible to properly get to meet the families. 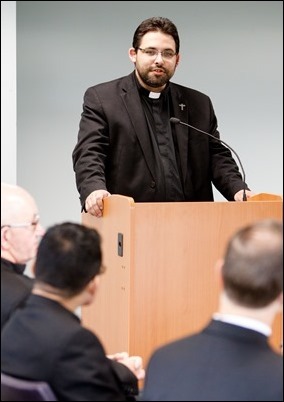 Following the luncheon, we heard remarks by Father Willington Oliveira on behalf of his class. 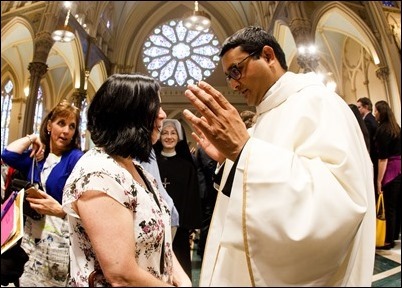 I also took the opportunity to present the parents of the new priests with the gifts of a rosary and a disc of photos from the ordination. 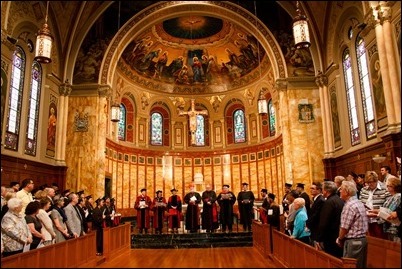 That evening, I went to Boston University for the presentation of the university’s Medeiros Scholarships. 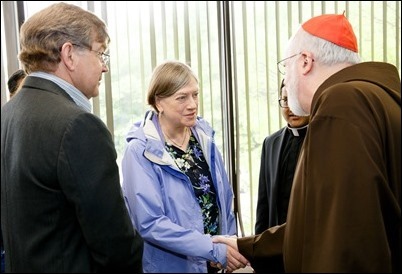 With us was Provost Jean Morrison representing President Brown, as well as Father David Barnes, the Boston University Catholic Chaplain. 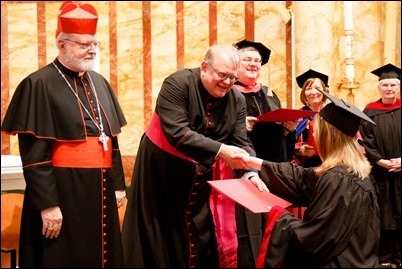 The Medeiros Scholarship is a full, four-year scholarship to Boston University presented each year to graduates of Catholic high schools in the Archdiocese of Boston. 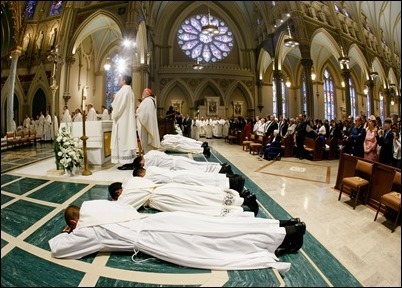 This tradition was begun many years ago by B.U. 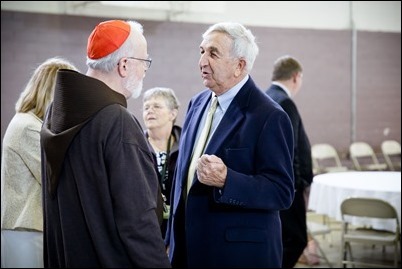 president John Silber in honor of Cardinal Medeiros. 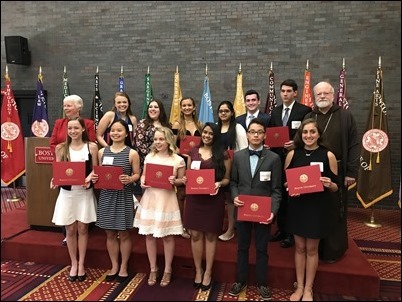 Over the years, they have provided these scholarships to more than 400 graduates of Catholic high schools in the archdiocese, representing a value of more than $50 million. 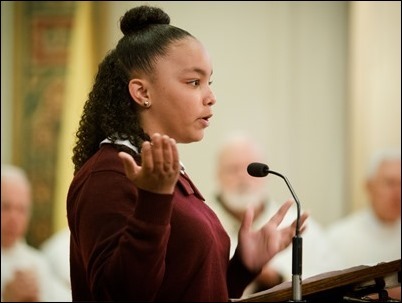 Finally, yesterday, I was very happy to celebrate the Mass for Ascension Thursday at St. Edith Stein Church in Brockton to mark the 10th anniversary of Trinity Catholic Academy. 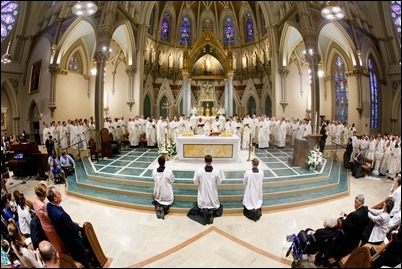 Many of those who were involved in the establishment of Academy were there with us for the Mass. 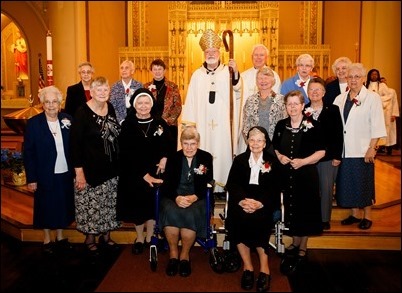 We were also so pleased to be joined by representatives of the different orders of religious sisters who laid the foundations of Catholic education in Brockton. 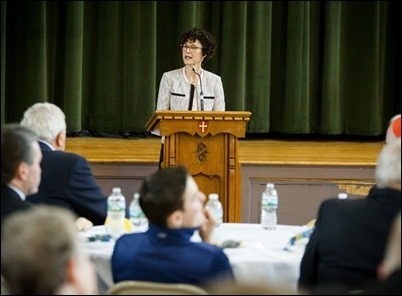 After the Mass, the school hosted a very nice lunch for us in the school cafeteria at which we heard remarks by Stonehill College vice president Father James Lies, founding board member Katie Conboy, Jack Connors and Mark Payson, the chair of the board of trustees. 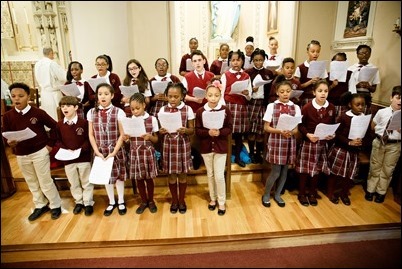 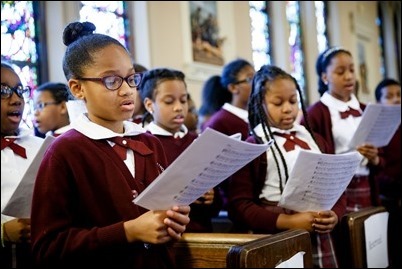 Trinity Catholic Academy is such a wonderful success story. 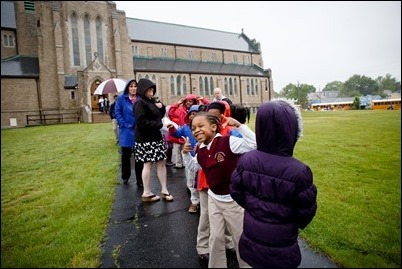 At the time of its founding, there were three Catholic schools in Brockton, all of them failing because of lack of enrollment and funds. 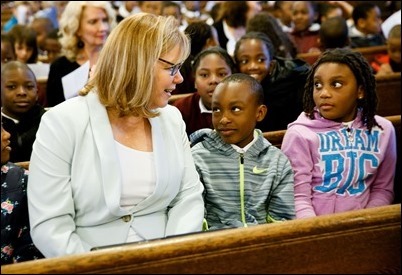 In response, the decision was made to form this new school with two campuses to replace the three failing schools. 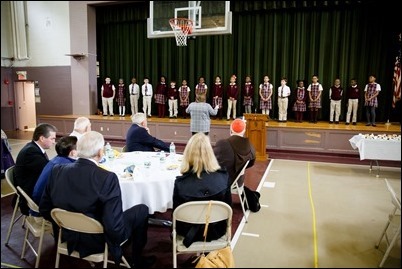 When it opened, Trinity Catholic Academy had twice the cumulative enrollment of the three former schools. 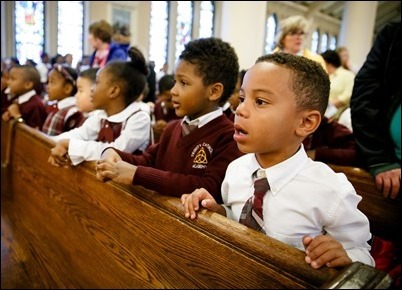 Today, the school continues to thrive. 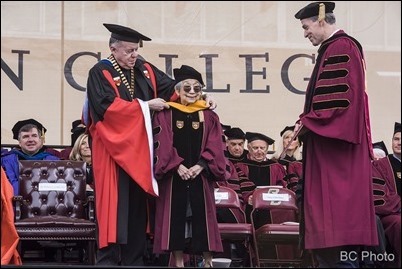 This is such a great testimony to all those who helped us form the Academy including Matt George, the late Tom and Mary Shields, Jack Connors, Stonehill College, Kathleen Driscoll and John Fish. 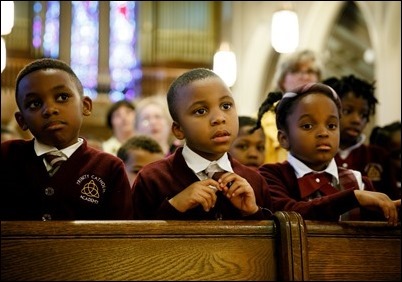 It was just wonderful to see the fruits of these efforts 10 years later.